Jemma’s xray was “slightly better” than when we left the hospital. They still see some stuff in the upper right lobe. The doctor said that it is most likely lung damage but they aren’t sure the effect, if any, it will have on Jemma in the future. She is too young to do the tests they would need to do so we are basically going to wait and see how she does over time. They are pleased with her overall progress. She hasn’t been to Physical Therapy yet is doing wonderfully all on her own. 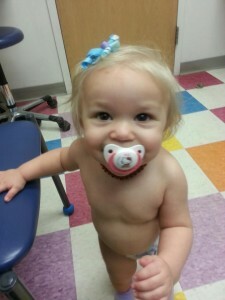 While we were at the office, she was walking around and being her silly self. They said she is likely a carrier for MRSA/VISA for life. That makes me extremely nervous. They told me to ensure I tell any doctor treating her (if she ever goes back to the hospital) about her history. I almost laughed at them. Like I wouldn’t spit that out in a rush the second we saw a physician! She weighs 20lbs, 6.5oz. She has gained weight since leaving the hospital. I told them she eats like a horse so it doesn’t surprise me. They are glad to hear she is eating well again. She showed them her big belly and shook her head when they asked her if she liked cheese, milk, and cookies. Her sleep issues are to be expected after all she went through. In the same sense, her anxiety issues are totally normal and are not expected to go away any time soon. She had her hand down my shirt the entire time they talked to us. That is her typical behavior but it really cracks up the doctors and nurses. She has done that for as long as I remember so it doesn’t even phase me but they all draw attention to it. They said she will be my “best friend” for many years. I’m good with that. We went upstairs to see some of the nurses who take care of Jemma. They were so happy to see her looking so good. She eyed up the nurses going into rooms and wasn’t too fond of the yellow gowns but was okay as long as they stayed away from her. We both got some hugs from some of the nurses. Sadly, none of the PICU nurses we wanted to see were there. She did really well with everything. She obviously remembered the xray because she freaked out really bad. She didn’t like being weighed either but did okay with that. They put the pulse oximeter on her foot and I thought she was going to take someone out she was so mad. She obviously has some memory of all she went through and that breaks my heart. Over time she will forget though and that is a blessing. I cried several times that day. I cried on the way there, sitting in xray, sitting in the office, and when we went upstairs. One of my favorite nurses told me it is totally understandable that I have some PTSD issues after all we went through. I just had issues with walking in there and felt my breath catch being in the xray again. I had to walk right by the door where we got the news that Jemma coded. I have never practiced deep breathing more than I did that day. For the future, they are going to test Jemma’s immunity again by checking titers after her next vaccinations. Every other immunology test came back okay so I have complete faith that these will too. We go back to see Pulmonolgy in 4 months. She sees her primary doctor in April and we will see one of the Infectious Disease doctors at the same time as she will be in the pediatrician’s office that day too. They have decided to not do any swabs or follow-up to antibiotic blood work right now. I am more than happy with that decision. Jemma has been through enough. I realized one thing that day… I am extremely nervous with Jemma being around other kids. One child was in the waiting room and was coughing. His mom said nothing about him coughing all over and not covering his mouth. I picked up Jemma and moved. But, I can’t possibly keep her free from germs forever. It is going to be something I struggle with for some time. My anxiety is so high. Keep Jemma in your thoughts and prayers. I am not sure what the future holds for my baby but I do believe that God has big plans for her. I am okay with whatever comes our way with these lung issues…. I have all I need… I have my baby with me. We will get through whatever the future holds. many thoughts and prayers for Jemma! I will definitely keep you both in my prayers! So glad Jemma is doing well. Thanks for the update. I can’t imagine the weight on your shoulders as you try to protect her through life. I’d want to put her in a bubble! But I know that is not practical. So much hospital/germ/disease scares me… especially for her little system. I pray that she continues on a path of health and longevity! I’m so glad to see that your little one is finally doing so much better. She will continue to be in my prayers. Thank you Sarita. I appreciate it so much. God is so good! I’m so sorry for what you and Jenna and your family have been thru and are still dealing with. She is a beauty and I will keep you all in my prayers! I’m sure both of your were worn out after all that. Please take care of yourself too. It breaks my heart that she has been thru so much in her short life.